Provide comfort for the family of Edward Goode with a meaningful gesture of sympathy. Edward Joseph Goode, 88, dearly loved husband, father, Grandpa, Papa Ed and friend, peacefully passed away in his home in Arlington, Texas, on February 2, 2019. Memorial Service: A private memorial service will be held at a later date. Edward was born on February 25, 1930 in New York, NY, to Edward John Goode and Anna Virginia Cox Goode. When he was five years old, the family returned to his father’s family home in Issaquah, WA, to take over the family business at Goode’s Corner. He graduated from Issaquah High School in 1948, and then attended Central Washington College of Education in Ellensburg, before transferring to the University of Washington where he graduated with a degree in Business Administration. While he was attending Central Washington, he met Beverley Lynn Duncan and they married on November 17, 1951, as he was preparing to enlist in the U.S. Marine Corp and was stationed at El Toro. After his discharge, in 1954 he began his career with BF Goodrich in Los Angeles. His growing family made their home in Fullerton, California, and Ed completed his Master’s Degree at Long Beach State. Beginning in 1960, company transfers took them to Tuscaloosa, Alabama, and then back to Los Angeles (Brea) in 1965, and then to Ft. Wayne, Indiana, in 1970. Ed was named Manager of the Woodburn, IN, tire plant in 1972. In 1992, Ed completed his 38 year career with BF Goodrich-Michelin in Akron, OH (Talmadge) as Vice President of Manufacturing and Engineering. Ed and Beverley were finally able to choose where they would make their next home and enjoyed 23 years of retirement in Sun City, Oro Valley (Tucson), AZ, appreciating the beautiful mountains and desert while golfing, volunteering, traveling and forming more amazing friendships before moving to Arlington, TX in 2017, to be closer to their children. A picture in their home depicts the words, “Lord, help me to bloom where I am planted and transplanted and transplanted.” and they took those words to heart. Ed and Beverley took every opportunity to immerse themselves and their children in the communities where they were transplanted and made hundreds of lifelong friends along the way. Ed was preceded in death by his parents and his sister, Juanita Moore. Survivors: Edward often spoke of his pride and love for his family and he leaves to cherish his memory his beloved wife of 67 years, Beverley, their four children and their families: Valerie Prange (Bill) of Arlington, Steven (Erica) of Arlington, Craig (Melissa) of Louisville, KY; and Edward Thomas (Ted) of Tuscaloosa. He also cherished the time spent with his 10 grandchildren and four great-grandchildren, with another preparing to join the Goode Guys in February. To send flowers in memory of Edward Joseph Goode, please visit our Heartfelt Sympathies Store. Love, Lauren sent flowers to the family of Edward Joseph Goode. There is a great future ahead rember Jehovah God and Jesus Christ promised us so may we continue to search for other great promise recorded in the bible.Revelation.21:3-4. My thoughts and prayers are with the entire family. Papa Ed will always have a place in my heart. 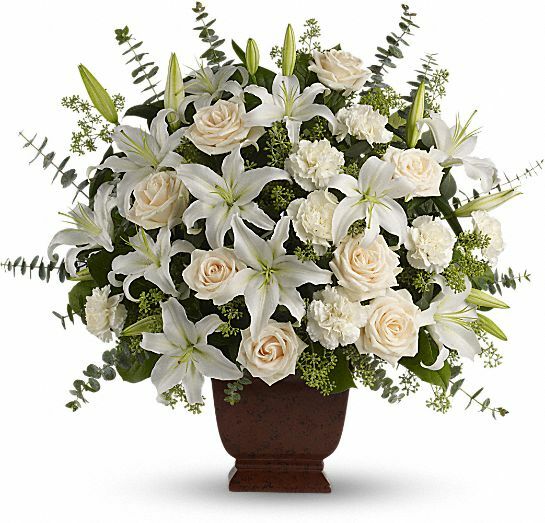 Love, Lauren purchased the Loving Lilies & Roses Bouquet for the family of Edward Goode. A living tribute to a life well lived. Rest well, Ed.